I have a love hate relationship with frittatas. I can’t tell you how many times I’ve removed the skillet from the oven with an oven mitt and then immediately grabbed the skillet handle with my bare hands. I’m only admitting to doing it twice…that’s all my pride can handle. In the case of your frittata, do what I say, not as I do! Your hand will thank you. 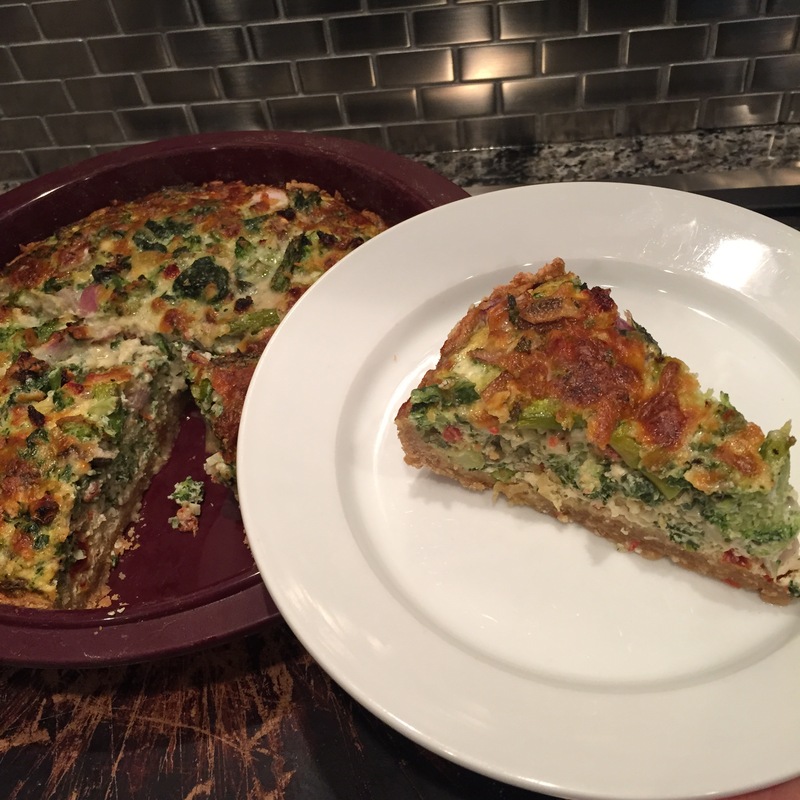 This week’s Bacon Red Pepper and Goat Cheese Frittata has interchangeable ingredients. If bacon isn’t your bag – omit it. The same goes for the red pepper. If you have great disdain for goat cheese, use your preferred cheese. 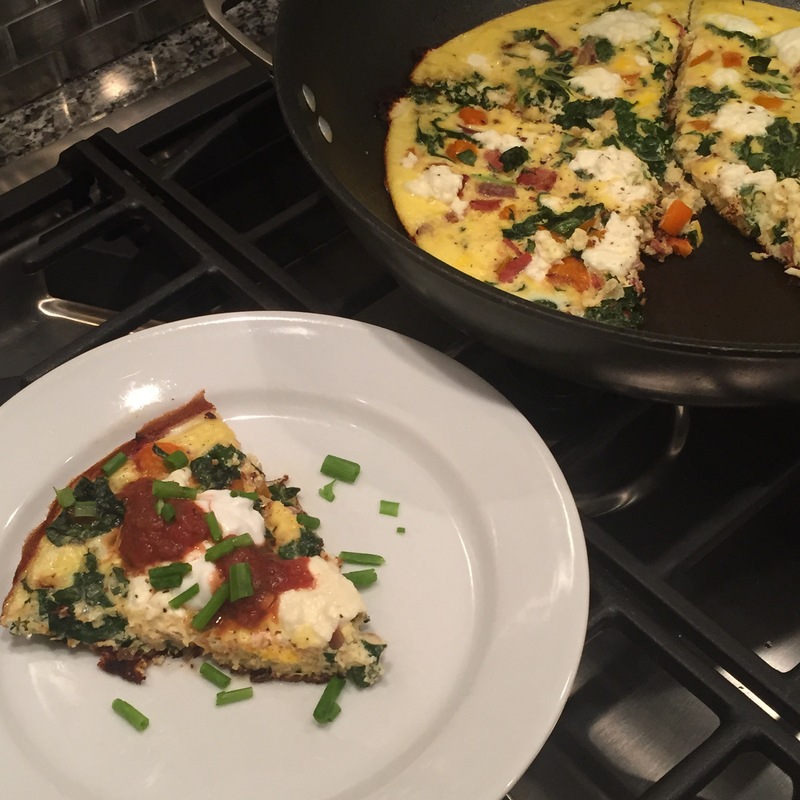 However, if you’re just unsure about goat cheese, a frittata is a great way to try it. It adds a certain creaminess that is oh soooo good! 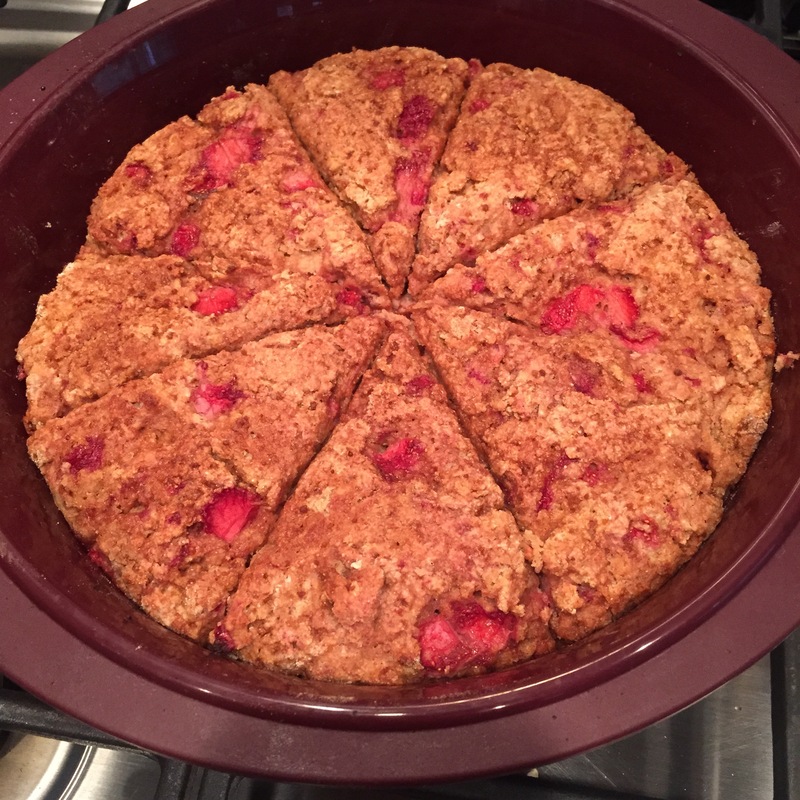 The Strawberry Scones are quite easy and much healthier than typical scones that are loaded with butter and bleached white flour. These are not overly sweet like a traditional scone that is sort of like a cross between a biscuit and a muffin. They are great with a cup of tea or coffee. Fast dinner needed? Farro with Arugula is your new best friend. Cook the farro according to directions, stir in the arugula and feta cheese. Finish with a lemony garlic dressing. This is a double duty meal because the leftovers are used to make a salad. Dinner in under 30 minutes? Yes please! 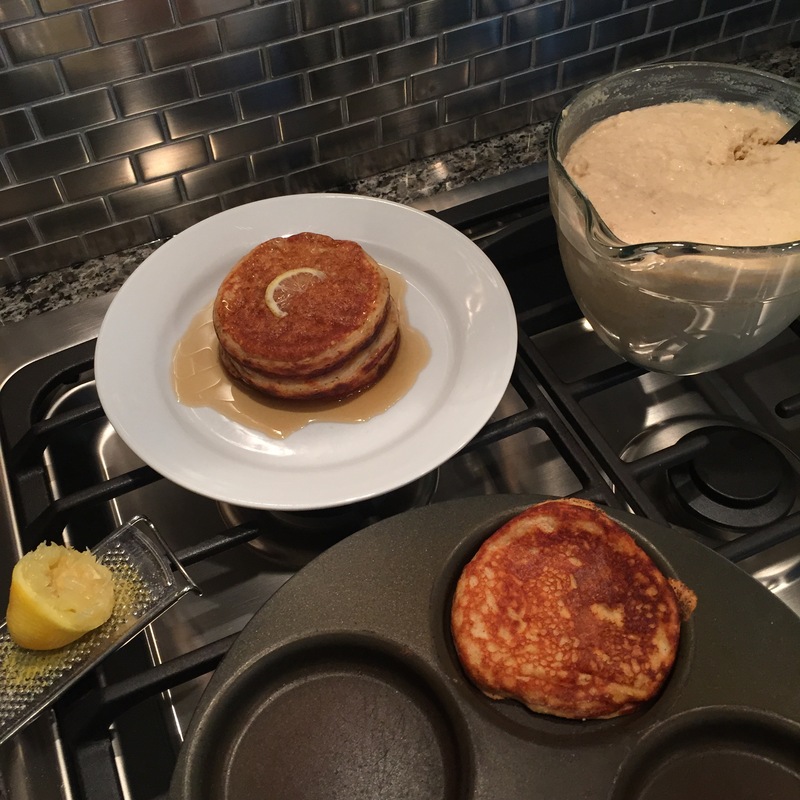 Finally, let’s take a moment to talk about Lemon Ricotta Pancakes. These babies are light, fluffy, and lemony. When topped with pure maple syrup, these go off the charts! If you’re unsure about your love for lemons, reduce the lemon juice just a bit. I’m going say it, but it’s gonna hurt me…you could probably make these without the lemon. The light fluffy texture the ricotta brings would still be great. Note:I can’t be held responsible for what you’re missing out on by omitting the lemony goodness. Directions: In a small bowl, mash ¼ cup strawberries. Stir in the Greek yogurt and honey. Set mixture aside. In a large bowl, stir together the flour, coconut palm sugar, baking powder, baking soda, and sea salt. Cut the butter and solid coconut oil into the flour mixture by mashing with a fork until it resembles coarse cornmeal. Gently stir in the remaining strawberries until evenly coated with flour. Stir in the yogurt mixture just until combined (it will be sticky). With floured hands, evenly press the batter in a silicone pie pan (or a greased metal pie pan). Cut the batter into 8 equal triangles with a knife. Sprinkle with the remaining 2 teaspoons of coconut palm. Bake for 12 to 15 minutes until lightly golden. Allow to cool slightly before using a knife to cut the precut sections. Directions: In a medium bowl, whisk the eggs, milk and salt/pepper. Preheat the oven to 400 degrees. To an oven proof skillet heated to medium heat, add the bacon. Cook for 2 to 3 minutes before adding the onions and bell peppers. Cook until the veggies are softened, stirring occasionally (about 5 minutes). Over stirring will prevent the onions from caramelizing which brings out incredibly sweet flavor. Add the kale, stirring a few times until it wilts. The next garlic step happens quickly … stir in the garlic. Allow it to cook for a minute or two at the most (just until you can really smell the garlic). Scrape the bottom of the skillet with a spatula to loosen any bits of food. Pour in the egg mixture to evenly coat the pan. Allow to cook until the eggs have firmed up around the edges. Evenly crumble the goat cheese on the top. Bake for about 5 minutes in the oven. It’s done when the eggs have firmed up in the center and the goat cheese is bubbly. I like to finish each sliced piece with a dollop of organic Greek yogurt, a few dashes of hot sauce or salsa, and some finely chopped green onions. Directions: In a glass with a lid, add all dressing ingredients. Lid the container and shake vigorously. Drizzle desired amount over the salad. (Refrigerate any remaining dressing for later use). Directions: In a medium bowl, whisk together the wet ingredients. In a small bowl, stir together the dry ingredients. Add the dry ingredients to the wet ingredients. Stir just until combined – do NOT over stir. Prepare as you would any other pancakes by adding a small amount of preferred oil to the pan (ideas: coconut oil, olive oil, or organic butter). Top with pure maple syrup! Note: You will need a total of 4 cups of organic arugula or kale for the entire meal. In a medium size stock pot, add the farro and broth. Bring to a boil and then immediately reduce to a simmer. Cover and cook per the package instructions. Drain the farro and return it to the stock pot. 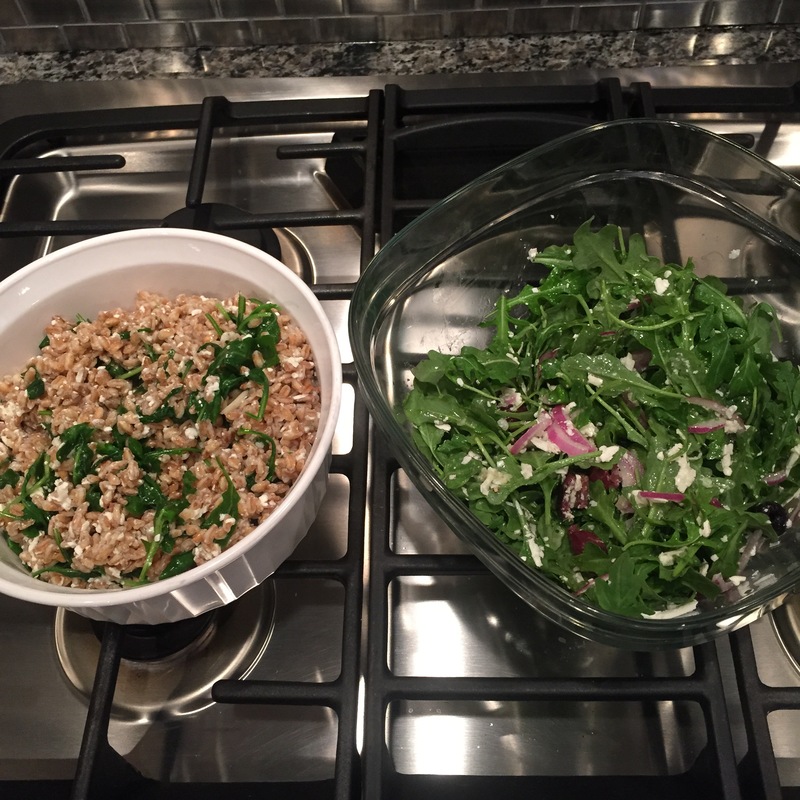 Mix in the greens (arugula or kale) and feta to the warm farro. Once the greens have wilted, pour one half of the lemon-garlic olive oil over the top and mix to combine. Season with sea salt/pepper to taste. Directions: Toss the salad ingredients and top with the remaining one-half of the lemon garlic dressing. Directions: In a medium bowl, stir together the flour and salt. Create a well in the middle of the flour. Pour the water and olive oil in the hole you created in the flour. With a fork, stir the flour into the water/olive oil. Once combined, form into a ball and wrap the dough with plastic wrap (covering the dough rather than covering the top of the bowl like a lid). Time Saving Tip: The dough is supposed to ‘rest’ in the fridge for 30 min. Who has time for that? Instead, ‘rest’ the dough in fridge while prepping the quiche mixture. Directions: Preheat oven to 375 degrees. In a large bowl, combine all quiche mixture ingredients and stir. Remove the dough from the refrigerator. Press the dough into the pie pan, evenly covering the bottom and the sides. (Note: The dough may not go all the way up the sides of the pan. No worries. The crust and eggs will join forces to hold it all together.) Pour the quiche mixture into the pie pan. Bake for approximately 30 to 40 minutes. To ensure doneness, slice the quiche with a knife. If liquid fills in the sliced section, give it another five minutes and check again. Two handfuls of your preferred organic greens, roughly chopped or torn by hand. Timing Tip: Preheat the oven to 425 degrees. Assemble the sandwiches. Prepare the broccoli. Add everything to the oven at the same time. You’ll flip the sandwiches and broccoli at about the same time too. Check on the sandwiches a few minutes early to ensure the bottoms are not getting too dark. Directions: Assemble the sandwiches as if you were making them for the traditional skillet version. Sandwich order: bread, cheese, basil leaves, tomato slices, a bit more cheese, bread). Place buttered side down on a baking sheet. (Bake at 425 degrees for approximately 8 to 10 minutes on each side. 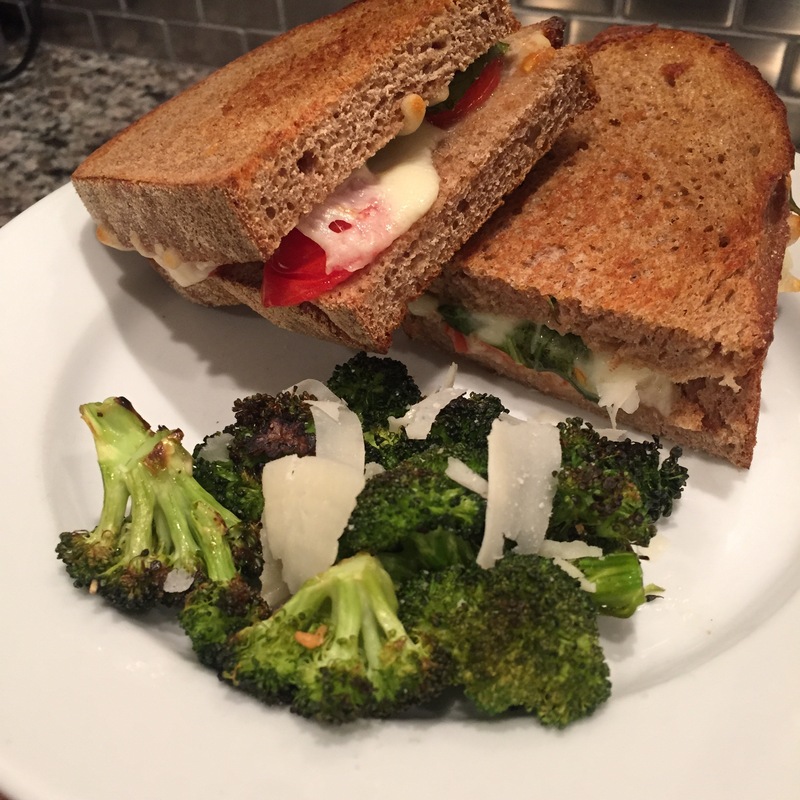 Remember, broccoli and sandwiches go into the oven at the same time). Directions: Preheat oven to 425 (bake, NOT convection). In a large bowl, toss the broccoli, olive oil, salt/pepper, & garlic. Arrange in a single layer on parchment or foil lined baking sheet. Roast for about 20 minutes (at 10 minutes, flip the veggies with a spatula). After removing from the oven, sprinkle with cheese and freshly squeezed lemon. Serve immediately.